You are here: Home / Android / Android 6.0, Marshmallow for grand 2 available now! Yeah you heard it right. There is solid reason for Grand 2 fans to delight. Samsung has always been choosy in providing updates to their devices, at least for the low end and mid-range devices. Android KitKat was the last upgrade provided by Samsung, and no updates since then. But you need not worry, the developer community has already started building Cyanogen Mod 13 for grand 2, which is based on Android Marshmallow i.e. 6.0. Last year too, there was unofficial CM12, based off on Android Lollipop available for grand 2 which gave the users taste of new Google’s operating system. For device which is 2 years old now, you have to rely mostly on the unofficial updates, since it is not flagship device! So, let’s see how to install Marshmallow on grand 2. This ROM is in development stage and not a daily driver. You might face bootloop, FC and other issues while using this ROM. Moreover, there is no RIL, so you won’t be able to make calls and SMS. Offline charging (not working on CM12). So, as I said, there is no RIL, so you won’t be able to use even the basic functionality. If you are using it as secondary device, than you can give it a try. However, it is not recommended to use it on your primary phone. Make sure your device is rooted before you install this ROM. You can check out our guide to root Galaxy Grand 2 the easiest way. Once you have rooted the device, just install custom recovery of your choice. Important: Backup your entire data or take Nandroid backup, just in case. Note: This ROM is for SM-G7102 version only, no other variant of Grand 2 is supported at the moment. Do not try it else you may brick your device. If you are not sure about the version of your device, navigate to Settings > General tab > About Device. You will find the model number listed there. Google apps for Android 6.0 – Link. Original thread on XDA – By @mukulsoni. Guide to root Grand 2 (If not rooted already). Download the Marshmallow ROM and preferred GAPPS package from the links above. Place the downloaded files onto your internal/ external storage. Boot your device into recovery mode. To do this, just power off your device and wait for few seconds. Now, press Volume up + Home + Lock key together until you see the following screen. Once you get this screen, release the keys, you will enter into recovery mode. If you get Android bot with red exclamation mark, which means you need to install custom recovery. As I said earlier, you can take backup of your current ROM. Just hit the backup button, select partitions to backup and swipe/ touch to backup. To perform factory reset, from the main screen select “Wipe Data”. Once you are done, go back to main menu. Select install zip and navigate to the location where you have saved your ROM and flash it. After that, flash the Gapps package which you have downloaded. When it’s done, just go back to main screen and tap on “Reboot to system now”. That’s it! 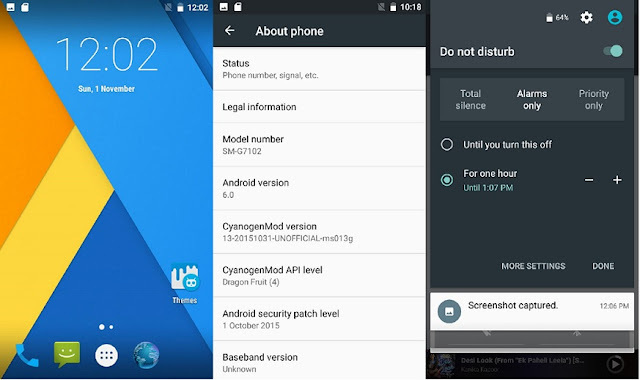 If you perform the above steps correctly, you should have Android Marshmallow for grand 2 installed.